It’s one of the largest conventions on our annual calendar, as 100,000 experts, celebrities and exhibitors from multimedia converge on Las Vegas today for the National Association of Broadcasters. It’s the ultimate marketplace for digital media content and entertainment delivered to new screens in new ways. From actress Betty White to Flamingo headliner Donny Osmond, it’s a star-studded affair -- but also serious business, with 60 global delegations from as far afield as Vietnam, Ghana and Poland attending. For the first time, delegates from Pakistan and Nepal will be at NAB. In all, 151 countries are represented with more than 1,500 exhibitors, 400 of which are from international corporations. In addition to the sprawling convention floor, there are international pavilions to promote Britain, Korea, France, Belgium, Bavaria and the U.S. There are so many overseas visitors flying here this week that the International Trade Center will provide multilingual staffs specializing in at least seven languages. Betty is a seven-time Emmy Award winner with a 60-year plus career and an author of seven books. The 90-year-old beloved from “The Golden Girls” and “The Mary Tyler Moore Show” will be inducted into the NAB Broadcasting Hall of Fame on Tuesday. “She has remarkable energy still and an incredible ability to connect with viewers. Her contributions to television and entertainment are extraordinary,” said NAB President Gordon Smith. The Pearl in the Palms on June 22, 2011. Also being inducted here will be Hollywood actor, director, writer and producer Garry Marshall. That takes place at today’s Television Luncheon. It’s the first time two individuals are being inducted for TV contributions into the Hall of Fame. Garry created “Mork & Mindy,” “Laverne & Shirley” and “Happy Days,” directed “Pretty Woman” and “Runaway Bride” and starred on “Murphy Brown.” Play-by-play announcer Bob Uecker also will be inducted. 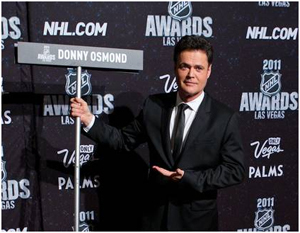 Donny will deliver a keynote speech at NAB’s Radio Luncheon. The former teen idol and “Dancing With the Stars” champion won’t be there as a singer, dancer and musician, but more wearing his business hat in his partnership with McVay Syndication, which distributes his radio shows. One session certain to attraction attention will be “The Sounds of Hunger Games.” Gary Ross, the blockbuster’s director, will be joined by his sound supervisor Lon Bender and his sound designer Bill Dean to discuss how the vision of the film was accomplished with sounds. (It was reported last week that Ross will not return for the sequel.) Oscar-winning “Titanic” and “Avatar” director James Cameron will discuss 3D advances in filmmaking in his session. There will be stars promoting their programs and producers pitching their next hoped-for shows in between the latest technology for broadcasting content. NAB has always been a peek into the future, and this year will be no different; this year’s theme is “Making Sense of the Great Content Shift.” Although the emphasis remains on content more than its delivery, it is a study of how the telecommunications industry will change in the future. Academy Award-winning director James Cameron discusses the future of 3D entertainment on opening day of the National Association of Broadcasters Show at the Las Vegas Hilton on April 11, 2011. When there’s a massive industry with huge financial earnings, government regulators will be keeping watch to see what new rules they can institute. Accordingly, the FCC with its Chairman Julius Genachowski and commissioners Robert McDowell and Mignon Clayton are here for a session on regulatory matters. After the recent GSA financial fiasco discovered at the M Resort here, don’t expect them to be partying beyond the official per-diem ceiling. NAB’s first meetings were held Sunday, and the convention-floor trade show opens today. NAB, which fills our nightclubs and restaurants, continues through Thursday. It should add more than $120 million to our economy -- and that official figure doesn’t including betting on craps, blackjack and roulette.